Privledges that simplify or lessen the expense of starting farm that place me in a better position than starting from scratch can never be understated. Specifically in my case the major considerations are access to cheaply rented land with a usable barn structure, many friends who share some of my interests who are constantly offering to help work on projects, local availability of feed and farm materials and many more. However one of the most valuable is an uncle who is deeply ingrained in the agricultural community through both work and hobby farming here in the Shenandoah Valley. He is a wealth of information and connections to whomever is relevant to my needs for assistance. Today it took on a much more tangable form of assistance. I have been buying 5 foot steel posts to get both permanent and temporary fences set up in anticipation of my first animals. 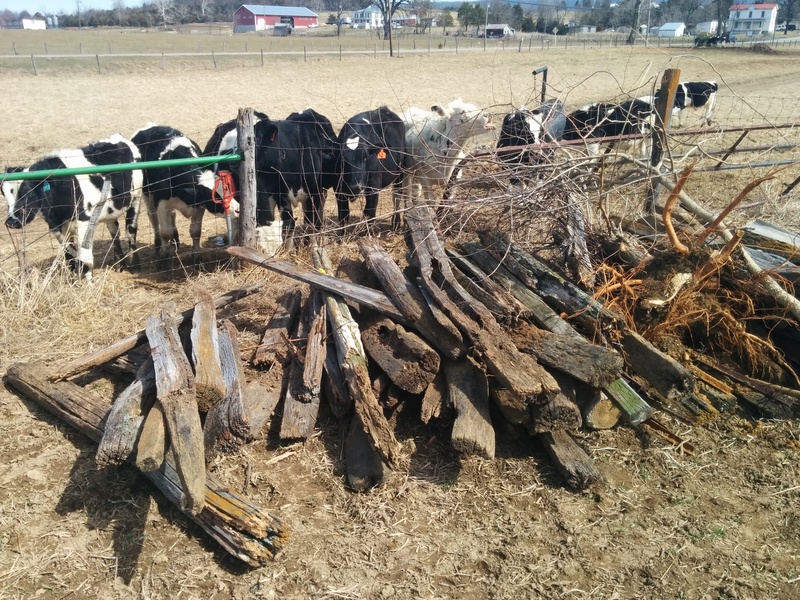 He told me he just had a fence removed that had been uneccisarily dividing his hayfield and that I was welcome to whatever posts I could salvage from the pile of removed fence materials. After a half hour if sitting through the wooden posts, I came out with about 25 usable steel T posts and many steel bars for temporary electric fencing. The latter are perfect for pigs! While I am incredibly fortunate to have my uncle as a resource, anyone can accomplish the same through intelligent networking. Join any local group for any interest you have in your farming endevours. People are not one-dimensional and you will find many overlapping interests with various individuals in those groups. Beekeepers especially seem to be the most diverse and eccentric people. Keep an eye out for local Beekeeping associations, grass-fed beef, certified natural growers, poultry associations and any other relevent clubs or societies! Thank you! There is useful stuff everywhere! My garden beds are build from old fence boards, some of my chicken pens are build from old residential decking that was torn down. Finding creative uses for discarded materials is a fun challenge and helps keep expenses in check. Yes! I’m about to break up an old sofa – so I’ll see what that brings me.